Frederick Alvin Briggs, JR. opened Allie’s Donuts in the summer of 1968. For over 40 years, his family has worked passionately to maintain the legacy that ‘Allie’ built in the early mornings back in the 1960’s & 70’s. With neighborliness and determination, Allie’s has succeeded in keeping the shop as ‘Old Fashioned’ as the donuts, each and every day. Nothing beats an Allie’s Donut in the morning, or any other time, which is why many Rhode Islanders consider a trip to Allie’s a family tradition. Narragansett Beer has been Made on Honor since 1890, and we’re proud to collaborate with local folks who embody that spirit of craftsmanship… especially if there’s a chance for free donuts. So here’s to grabbing a dozen for the next family trip, and here’s to the rich deliciousness of Allie’s Double Chocolate Porter! 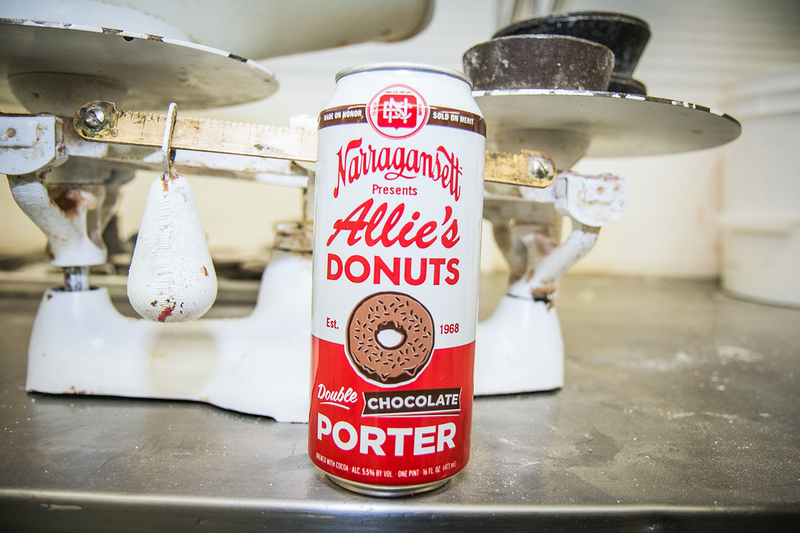 Roll out the Barrel: We have teamed up with another one of our favorite Rhode Island treasures, Allie’s Donuts to create the new Allie’s Double Chocolate Porter. 5.5% Alcohol by Volume and 15 IBUs, the new Allie’s Double Chocolate Porter is available on draft and in sixteen ounce tall boy cans throughout the fall and early winter. Quality Supreme: The Allie’s Double Chocolate Porter is a malty blend of our classic Porter combined with cocoa nibs, chocolate malt, and a hint of vanilla. A smooth, dark brew that is flavorful and filled with delicate complexities, but is never overpowering. Taste & Enjoy: Drawing its rich chocolate base from cocoa nibs, deep and roasty body from chocolate malt, and subtle its finish from just a hint of vanilla, the Allie’s Double Chocolate Porter is reminiscent of Allie’s famous old-fashioned double chocolate donuts. The History: Whether it’s a lazy Saturday morning tradition, a tasty birthday celebration, or just a pick-me-up on a bad day, Allie’s old fashioned donuts have filled a special place in Rhode Islanders’ hearts for nearly 50 years. We have combined every local’s favorite pastry with our classic Porter to give people an authentic taste of two Ocean State staples.